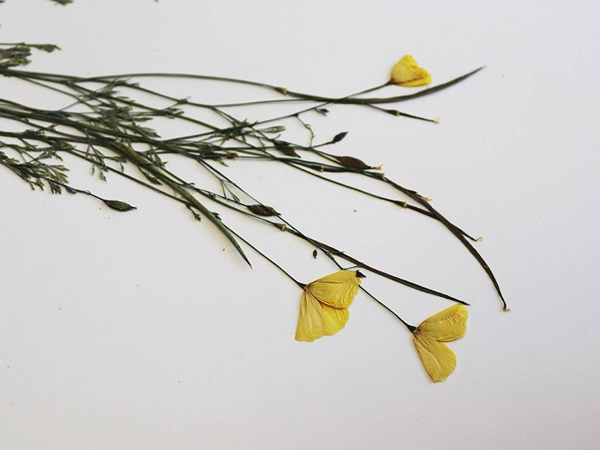 The Herbarium is recognized throughout the world for its strength in documenting the diversity, distribution, variation, and ecology of more than 6500 California native plant species. 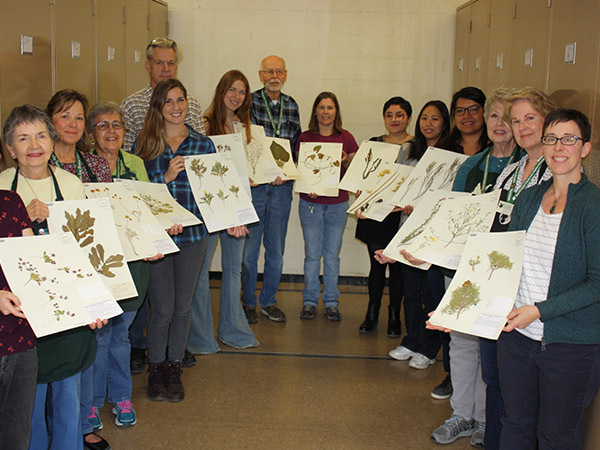 The combined Herbarium of Rancho Santa Ana Botanic Garden and Pomona College (RSA-POM) is a museum-quality collection of vascular plant specimens. 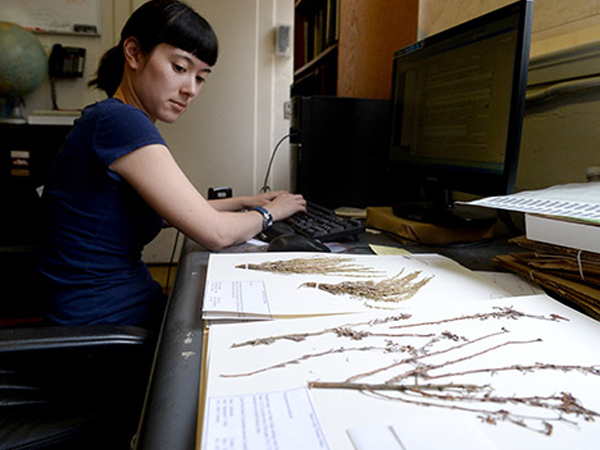 With current holdings totaling over 1,200,000 specimens, the Herbarium is the tenth largest in the United States and third largest in California. The holdings from Southern California exceed 250,000 and are unsurpassed by any other herbarium. In recognition of its overall strength, RSA-POM has been designated a national Research Resource Collection. Approximately 95% of the collection is composed of mounted sheets and filed according to a standardized system of classification. Ancillary collections that augment the collection include a cone & fruit collection, wood collection, fluid preserved collection, and pollen and anatomy slide collection. The RSA-POM Herbarium is an active member of the Consortium of California Herbaria. Specimens in the collection are arranged by class or subclass: Psilotopsida, Lycopsida, Sphenopsida, Filicopsida, Gymnospermae, Angiospermae (Moncotyledons, “Dicotyledons”). Within each of these units families are arranged in alphabetical order. Within each genus, the collection is organized by geographic region. C. F. Baker, R. C. Barneby, L. Benson, S. Boyd, S. Carlquist, A. Davidson, C. Davidson, P. H. Davis, M. DeDecker, M. B. Dunkle, F. R. Fosberg, H. S. Gentry, V. Grant, R. Gustafson, G. B. Hinton, E. C. Jaeger, M. E. Jones, C. L. Lundell, Y. E. J. Mexia, P. A. Munz, E. Palmer, F. W. Peirson, C. G. Pringle, P. H. Raven, J. C. Roos, T. S. Ross, A. C. Sanders, R. F. Thorne, L. C. Wheeler, and C. B. Wolf. More than 500,000 (~42%) of the >1.2 million herbarium specimens held by RSA-POM have been databased, which includes all of our California holdings as well as many specimen records in North America and worldwide. The majority of these specimen records are available through the RSA-POM web portal and more will become available as new records are uploaded. All California specimen records are also available through the Consortium of California web portal. Natural history specimen collections offer a lens into the past and a means to envision the future. Collections are especially important in predicting biodiversity change with shifts in climate and land use. In 2016 the RSA-POM Herbarium received NSF funding to process, curate, and digitize 30,000 plant specimens collected by ten significant botanists of the 20th century. Seventy percent of these were collected from 15 of 34 designated world biodiversity hotspots; thirty percent represents the California Floristic Province biodiversity hotspot alone. Several specimens have been identified as valuable type material (i.e., specimens used to describe and name species new to science). To date, over 17,000 specimens have been processed since the project began. Curation of these collections is providing physical access to collections that have until now been unavailable for study, and, in turn, will promote discovery of species new to science and yield new distribution and phenology data. Importantly, curation of these important collections is ensuring preservation so critically needed. Digitization efforts are providing access of this rich source of specimen data to researchers, students, and the public. Integral to the project are activities involving participation from graduate students, undergraduates, and high school students. Notably, the Herbarium has expanded on a successful undergraduate internship program by engaging underserved youth from the Greater Los Angeles metropolitan area. Especially targeted are at-risk and transitional aged youth at the high school level, who are being trained in a six-week summer junior intern program. All interns participate in workshops that serve to connect students to collections, natural history, and biodiversity. The final piece of this project includes an exhibit at RSABG to highlight the activities and student participation in the project. Marcus E. Jones (1852–1934), geologist, mining engineer, and self-trained botanist, became one of the most prominent botanists of the American West. Most active during the late 19th century into the early part of the 20th century, Jones traveled extensively throughout the western United States and Mexico, collecting thousands of plants, and photographing and recording detailed notes of the regions to which he traveled. Jones’ plant collecting at the turn of the turn of the century provided an early comprehensive characterization of the flora of the West; he collected in areas that were poorly known, some of which have since been developed. Jones also described hundreds of new species, many of which are represented as type specimens. Jones’ influence on botany is great, and his works and supporting materials (i.e., specimens and archives) are continually sought. Rancho Santa Ana Botanic Garden (RSABG), the locus of Jones’ archives and plant specimens, receives frequent requests to view and study Jones’ photographic slides, notebooks, and plant specimens. Rancho Santa Ana Botanic Garden has received support from The Andrew W. Mellon Foundation to digitize and make available the most botanically and historically significant components of the archives and collections of Marcus E. Jones. Prioritization of the project focuses on the archives and plant collections associated with several trips that Jones made to Mexico (1892, four trips during 1926–1930) and Baja (1882), and collecting notebooks and other written materials from field trips that emphasize plants or collecting. Following the established protocols of the Global Plants Initiative, we have databased, barcoded, and digitized more than 3000 herbarium specimens from Jones’ 1892 and 1926-1930 trips to Mexico and 1882 trip to Baja California. At present we are databasing and imaging his collections from western North America (excluding CA), and thus far have digitized >5000 of these collections.